Soo... I just found this article. What are your thoughts on this? Do you think it would be successful? Would you watch it? Personally, I'm having my doubts. I feel it wouldn't be able to live up to the movies, but then what could ever live up to those films? I think it would be a bit more successful if they took the same approach My Little Pony does, focusing on friendships and teaching lessons while going on adventures, as opposed to it being similar to The Avengers. Will I watch it? As a devoted Lion King fan I'll certainly give it a go and see if it's worth watching. But honestly, I'm having huge doubts. 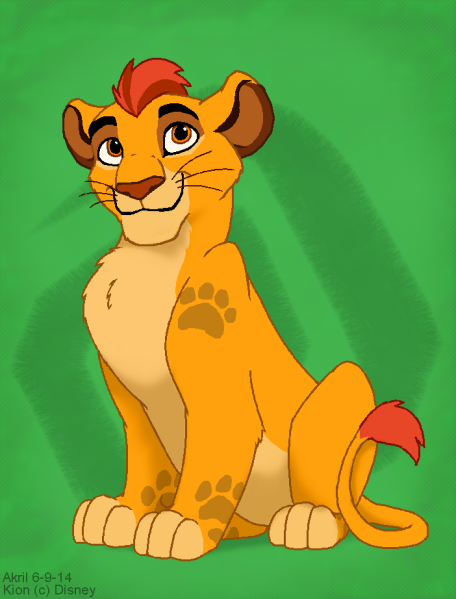 Also, apparently Simba has a son named Kion now. Considering that it's aimed at preschoolers, I can safely say that it will not live up to the movies. However, since they are trying to make it educational rather than a Saturday morning junk fest like Timon and Pumbaa, they might not even completely blow it up. Wow. I was genuinely surprised to hear about this. I was prepared to see some chibified CGI version of TLK, but seeing a style so similar to the traditional animation of the original movie was really refreshing. I was actually inspired to draw Kion (and I haven't done TLK fan art for years). But seriously..."Kion"? It sounds almost like the writers were stumped for a name and were staring at the The Lion King logo for several hours before one of them got the brilliant idea of replacing the "L" in "Lion" with the "K" from "King". I'm predicting a whole lot of fan theories stemming from those black strips on Kion's ears ("ZOMG, he's Simba and Zira's secret son!!1! "), and sadly, perhaps even more "Simba's son gets brutally murdered" scenarios. 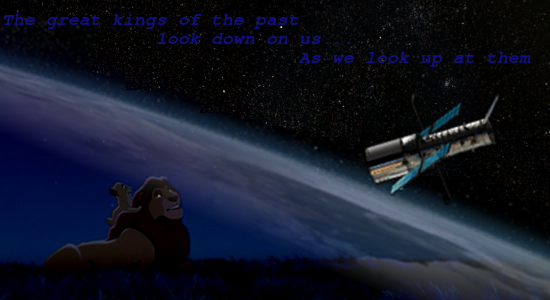 EDIT: And did anyone else think "Oh my gosh, it's cub Mufasa!!" when they saw that first screenshot? EDIT 2: I just had a thought: When the concept art of Naanda was first noticed, everyone in the fandom was all "Yaay, new character, new character!" even though all we could see was a heavily shadowed view of her back and all knew about her was that she was Sarabi's sister. Yet, even though two early drafts of the script Naanda appears in were made public and revealed that she is Nala's mother over a year ago (and only related to Sarabi in one of the drafts), fans are still depicting Naanda and Sarafina as separate characters...even though technically, Sarafina is essentially Naanda with a different name. Now this new character has emerged. We've gotten a fairly good look at his design and we know the basic part he is going to play in this new series, yet everyone is all "Yaay, it's Kopa, it's Kopa! ", even though the only things we know that Kion has in common with Kopa are his relation to Simba and his overall "Simba cloniness" (seriously, though -- name one semi-canon male cub that isn't a Simba-clone to some degree). *However, if Kion likes to spend a lot of time listening to his elders telling him stories, that might give that statement a little more weight. Last edited by Akril on June 10th, 2014, 11:30 am, edited 1 time in total. I'll give it a go. Will be fun seeing Simba again. Another thing I wanted to add is that if the picture is of any quality control for the show, it will look a heck of a lot better than the T&P TV show. The series will be about Kion, the son of the now-grown “Lion King” protagonist Simba, who assembles a group of animals to help him protect the jungle prideland as part of a group called the Lion Guard. Disney Junior plans to launch “The Lion Guard” with an hourlong movie in November of 2015, followed by regular episodes the following January. Just... just ohmygosh ohmygosh ohmygsh! Yay! Can't wait! Sweet! I'm going to have more resources to make graphics with!